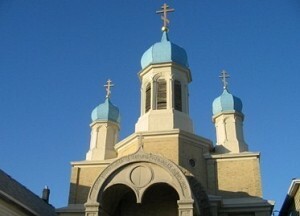 Saints Peter & Paul Orthodox Church, Bayonne NJ, celebrated the 90th Anniversary of its founding. Three events marked this milestone: The first was on Wednesday, 10 October, when the miraculous Myrrh-Streaming Hawaiian Iveron Icon of the Most Holy Theotokos came for a visit; the second was on Sunday, October 14, when the Divine Liturgy was followed by the official opening of the Church Library with a Molieben served in the parish hall; the third celebration was on the weekend of 27-28 October as Bishop Michael celebrated Great Vespers, a Panikheda for departed parishioners, and the Hierarchical Divine Liturgy on Sunday followed by a celebratory banquet. Archpriest Joseph Lickwar (Diocesan Chancellor); Archpriest Samuel Kedala (New Jersey Deanery, Dean) along with 10 other diocesan/local clergy concelebrants. Nearly 250 faithful and visitors prayed at the service, followed by an anointing with the distinctively fragrant myrrh oil that flows from the Icon. “The anointing took almost two hours,” said Father Igor, “but people of all ages ... young and old, adults and little children ... patiently waited in line to be anointed. I am thankful to the Lord that we all were able to have that personal experience of the Mother of God touching our hearts and prayerfully sharing with us her Son’s Grace.” At the end of the service Reader Nectarios, the custodian of the icon, presented the parish a beautiful copy of the Hawaiian Iveron Icon of the Mother of God, which will be placed in the church for prayerful services and veneration. The third and the final celebration took place on the weekend of 27-28 October. On Saturday, Bishop Michael was present at Great Vespers, followed by a Panikheda for all the departed members of the parish. At the Panikheda, Father Igor was joined in prayers by: Archpriest Wiaczeslaw Krawczuk (New York City Deanery, Dean) and Archpriest John Fencik (Rector of Saint Mary’s Carpatho-Russian Church, a neighboring parish). It was an important service to commemorate all the departed parishioners who were part of the church history during those 90 years. At the Hierarchical Divine Liturgy on Sunday special prayers of thanksgiving to the Lord were offered on behalf of all present for the service. His Grace and Father Igor were joined by: Archpriest John Fencik and Archdeacon Michael Suvak (Cathedral of the Holy Virgin Protection, New York NY). At the conclusion of the Divine Liturgy, Vladika Michael presented five grammata (honorary certificates) to highly dedicated members of the parish: John and Helen Wanko, Marge Cimbolic, Olga DeMay, and Theodore Benda. Due to illness and hospitalization, a grammata to Theodore Benda was presented by Father Igor during his pastoral visit later that week. Following the Divine Liturgy, a banquet completed the celebration. “It was a truly prayerful, inspiring, and wonderful weekend to conclude the festive events of this important milestone in the parish history,” said Father Igor.